It's Father's Day here in the US, a day in our household that includes cooking all of my husband's favorite meals. On this June Garden Blogger's Bloom Day, I'm reminded of how much I appreciate my husband for letting me do what I want in our gardens. He sweetly keeps the lawn mowed and helps me water our vegetable garden but never tells me no or comments that my obsessive gardening ways are a bit over the top. Thanks dear! I wouldn't be able to have my gardens with out you! And now onto what is blooming in June. 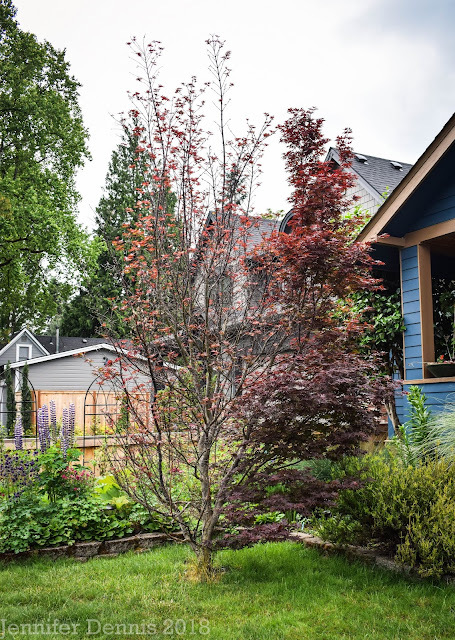 It's a mixed bag of weather as spring moves into summer here in the Pacific Northwest. Rainy days linger but this year we've already seen week long spreads of sunshine and warmth. My peony put on a fantastic display of scent and color. Deep, rose pink color with a delicious scent..and it was a gift from a neighbor's long established cottage garden. 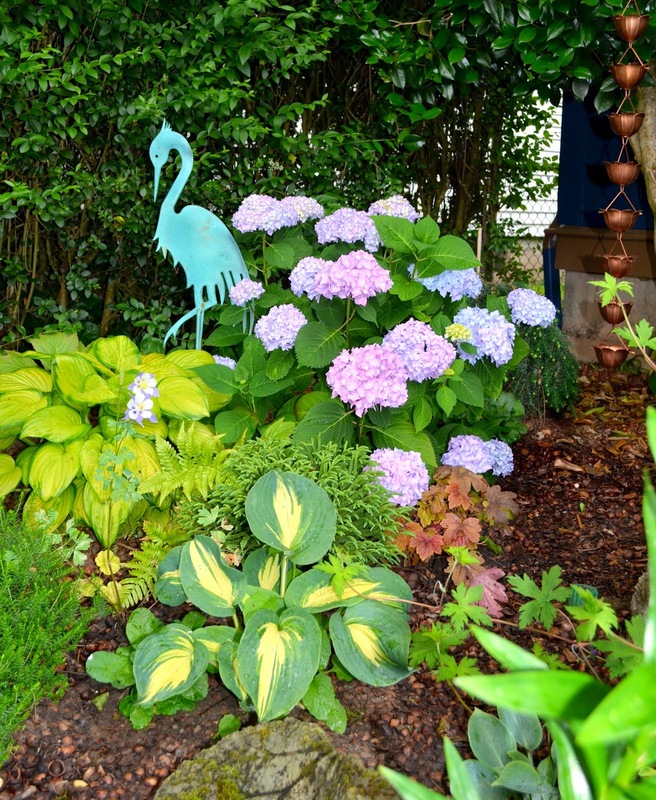 The back corner of my shade garden has my Endless Summer 'Bailmer' hydrangea blooming with um..not so blue blooms. I've enjoyed the foliage color combinations of 'Sweet Tea' Heucherella, Autumn Fern, Blue Columbine, Paradise Island hosta, Great Expectations hosta and Dwarf Japanese Ceder 'Little Diamon' (Cryptomeria Japonica 'Little Diamond'). I feel like I've finally gotten this corner 'right' and will be excited to see these plants mature and fill in. Like any good Dutch-descending gardener, I've got plenty of orange blooms in my garden. 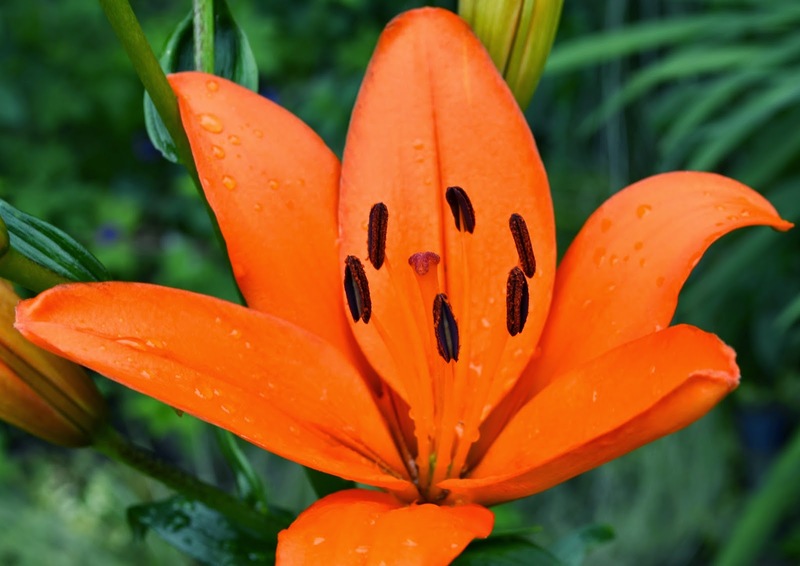 Just in time for the fantastic win over Spain in the opening of 2014's World Cup, this pretty orange lily opened on the very day of the win! This garden traveler was removed from my tender hosta gardens to the weed patch of buttercups. Maybe he'll help clear out that horrific space? And with all things June, it means the lavender is blooming, providing sweet scents along walk ways. I'm terrible about tossing plants and ended up salvaging several English lavender plants from one of my perennial gardens and placing them in pots this past winter. I have been rewarded with happy container plants that are complimenting their container mates quite nicely. Happy Garden Blogger's Bloom Day! Join Carol over at May Dreams Garden to see beautiful blooms from around the world. Lovely blooms! Especially the Cistus. Lovely pic of the lavender. Ironically, living in one of the wettest parts of England, I can't grow it! Perhaps I should give it a try in pots too. Okay your first photo has left me speechless. What a combo! Everything is looking wonderful, Jenny. 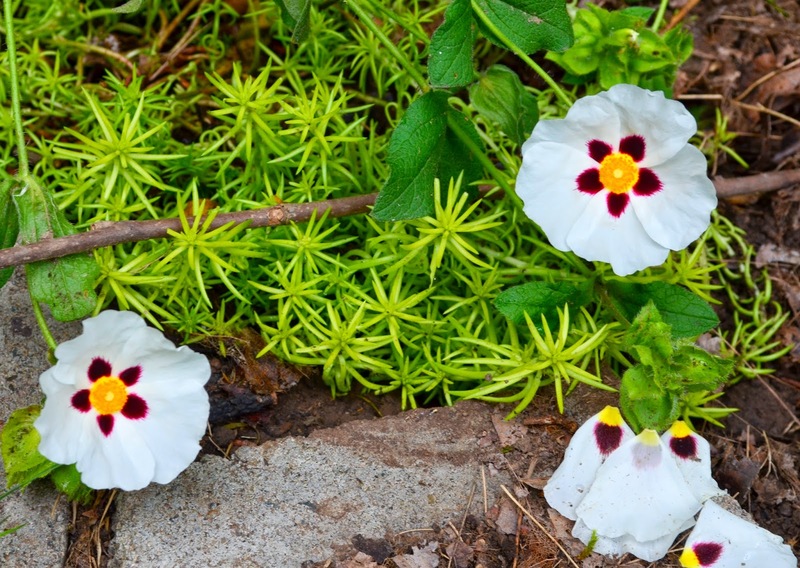 Oh, that rock rose is gorgeous! And I envy your peonies. I stopped growing them because I always forgot to stake them and they'd end up blooming on the ground. Happy bloom day! 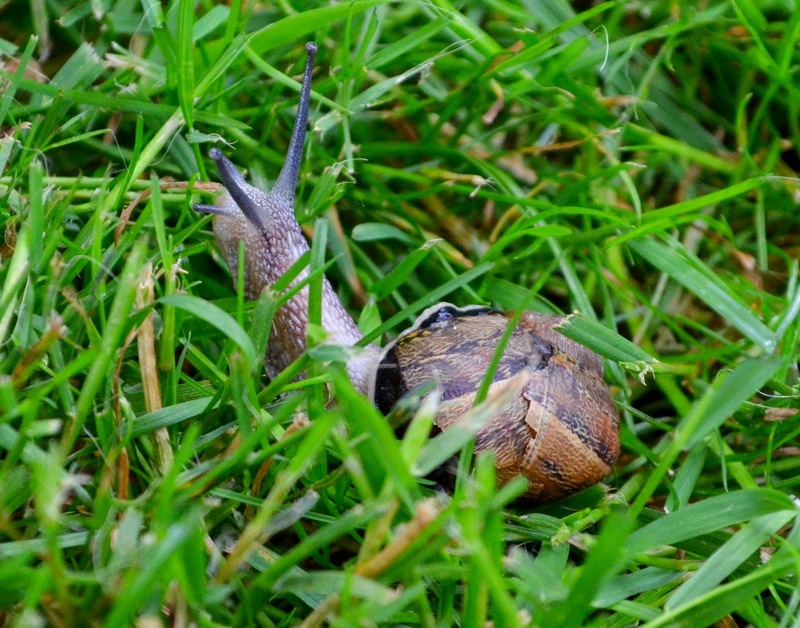 You are the first person I know to relocate one of those garden visitors rather than squish him. You deserve some sort of humanitarian, er...slugarian...award. Hi Jennifer. Your husband sounds just like mine..."never tells me no or comments that my obsessive gardening ways are a bit over the top". Isn't it great to have so much love and support? 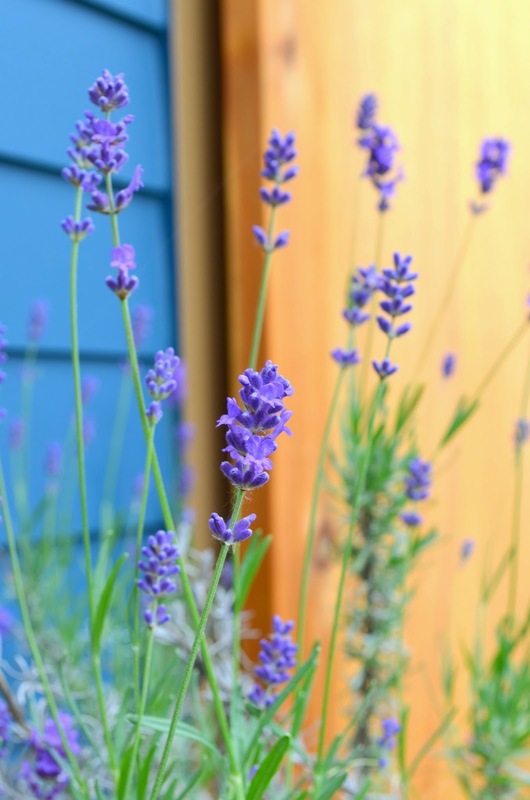 Wow - that last photo of lavender against the blue and yellow made my Swedish heart twitch a little. So pretty! Alas, Sweden didn't even make it into the World Cup this time around, so I'll have to root for my other country! And, that Cistus/Angelina combo is stunning! Gorgeous blooms all! 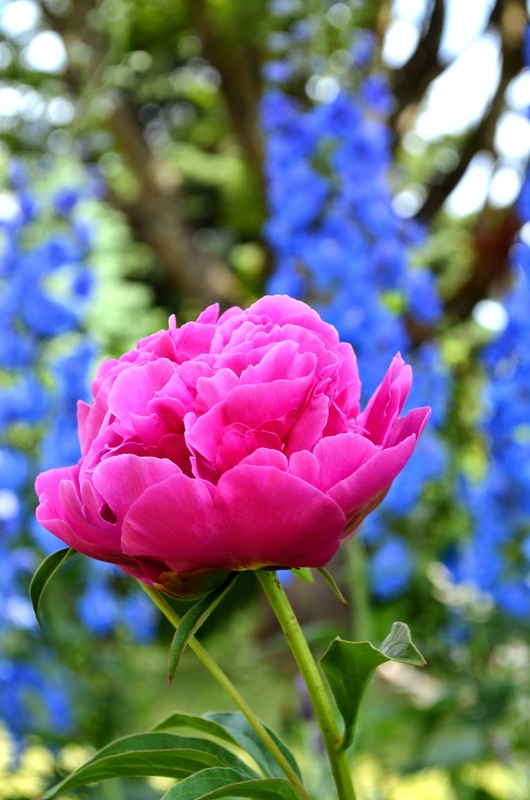 The first picture of the peony in front of delphiniums reminds me of the gardens in my home town in Alaska. Those two perennials make it through zone 3 winters and look beautiful together!